When guests first arrive on our island in Belize, we take them on a tour. In about 45 minutes we show them everything they need to know about the island for the week: where their cabana is, where the bathrooms are, how to check out and return our sport gear, where to find the cold beer, etc. It’s my job to conduct the tour, and one of the odd things that happens every single week is I can’t keep the tour moving because of hermit crabs. People see a hermit crab for the first time, and they come to a screeching halt. By Day 3 they are over it, but at the beginning, they are transfixed. 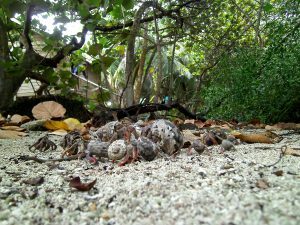 As the week goes on, people start coming to us asking why all the hermit crabs are collected together, in what looks like an impromptu convention, on the path near their cabana. And the answer is surprising: it’s a potential hermit crab shell exchange. 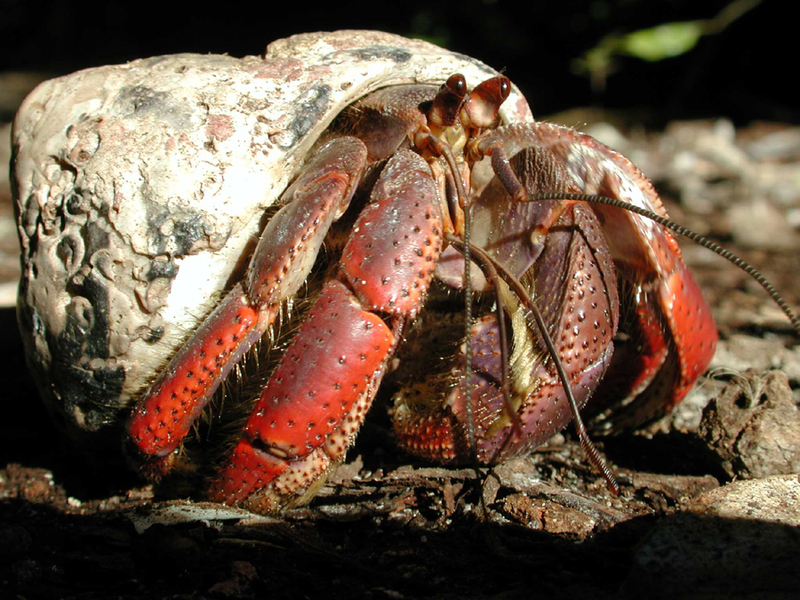 Hermit crabs do not have the ability to make their own shells. They have to move into someone else’s’ shell. Or someone else’s anything. I have seen them in film cans, shampoo bottle caps, and champagne corks! So when they are babies, they can’t move into a huge shell. The shell has to fit them. What this means is as they grow, they get too big for their britches, as they say. They get too tight, and they have to find a new shell and move out of their current shell and into the bigger one. It follows that when that hermit crab abandons their shell, another, smaller, crab will want that one, and they will move out of THEIR shell, creating a new home for someone else. There it goes down the line, each shell that is abandoned gets smaller and smaller. Once you know about this, you will start to notice that there are not any empty shells lying around anywhere. If you happen to find one, put it on the path near where you walk by all of the time. In less than a half a day you will see not just one, but many crabs grouped around it. For even if that shell doesn’t fit one particular crab, he knows that this empty shell will create another available shell his size eventually. Hermit crabs are ALWAYS looking for a new, slightly larger, shell. So what this boils down to is this: the premium piece of real estate is the largest shell. One Grand Daddy shell will provide homes for everyone. So in an odd reversal of the usual order of things, it is the largest creature that is at the biggest disadvantage. All of the other crabs will gang up on the big one, and pull him out of his shell! I kid you not! He dies, for he has nowhere else to go. Then everybody else moves up. Sometimes one of these conventions doesn’t turn into an actual exchange. If there is no empty shell, they are actually trying to decide if they are going to gang up and pull the big guy out of his shell or not. All of the crabs feel each other for a while, and then they are just as likely to wander away as to take action. In this video, you will see that Larry Staples did find an empty hermit crab shell to place by his cabana, and it is causing quite a stir. 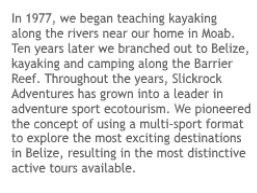 When you decide to join us on one of our Belize adventure packages at our island or on the Belize mainland, you do show up with some expectations. Our guests expect the weather to be wonderful, the guides to be qualified and fun, the food to be fantastic, their cabana to be super cool, and the caves to be exciting; and our guests are not disappointed. Each week I receive emails from guests re-entering their lives after their time with us, telling me that we exceeded all expectations. Even if the weather isn’t hot and dry, it’s still wonderful. A private island in the Caribbean… what’s not to like? Last season I invited my BFF Kathe O’Donnelly to the island, and afterwards we traveled together to inland Belize for a week or so. Looking at her photos this many months later, I see things I don’t usually notice… I’ve spent years in Belize, and I take many of these wonderful sights for granted. It is so refreshing to see the country through her eyes. Because now I see that there are a lot of other wonderful things about traveling in Belize that can take you by surprise. I see these “bonuses” in Kathe’s photos. Paying attention to unexpected views can make your trip even more memorable. Click each photo below to see how well she captured these amazing vignettes. It starts on the plane flying down. When you are almost to Belize City, the views out of the plane can be stunning! Mainland hotels and restaurants have some wonderful sculpture. Of course you can find galleries where this stuff is for sale, but it would be a project to get them home. But it’s easy enough to export pictures, I love all of these modern-Mayan artworks. When you get to the island, you are expecting the underwater creatures to be astounding, because Glover’s Reef is a world-famous Marine Reserve. But you aren’t expecting the land animals to be so much fun. For example, have you ever seen a hermit crab shell exchange? And did you know we have two super-cute bunnies on the island? If you also go inland you will find a whole bunch of surprising bits and pieces all over the country. For example, they have wonderful cemeteries! And tons of groovy little hole-in-the-wall diners. And one of the most surprising of all, lots of wonderful architectural details!